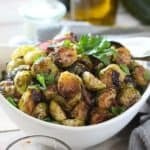 Easy Balsamic Roasted Brussels Sprouts! 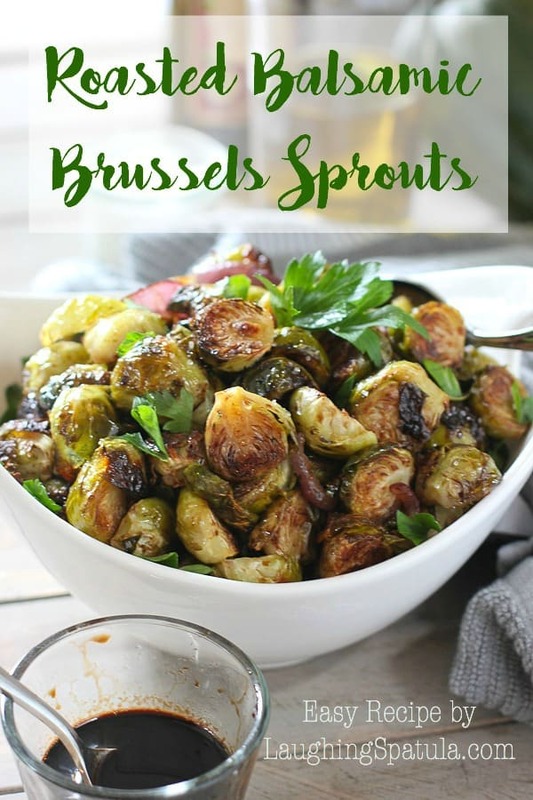 – These beautiful brussels will make you forget your eating your veggies! 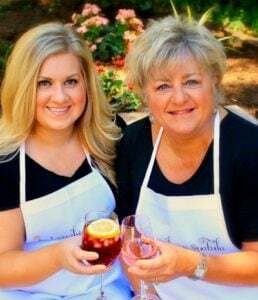 Let’s start this new year off right with a beautiful, healthy, easy to make veggie dish! I spent the last two weeks in Maui with all my favorite people. I am in need of some serious veggies in my life! Rumor has it you can not live on lava flows and fish tacos alone…say what? 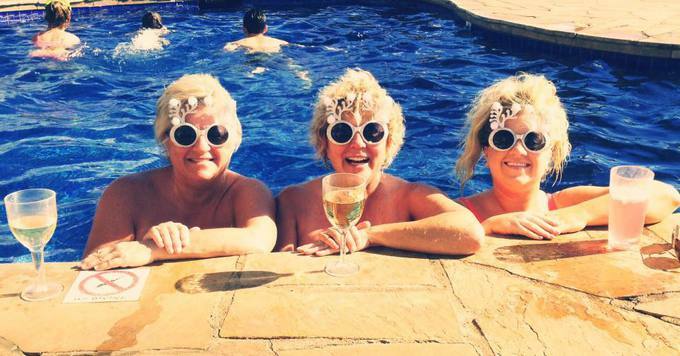 How many blondes does it take to have a pool party? Three! Me, my BFF Raela, and gorgeous daughter Rachel! 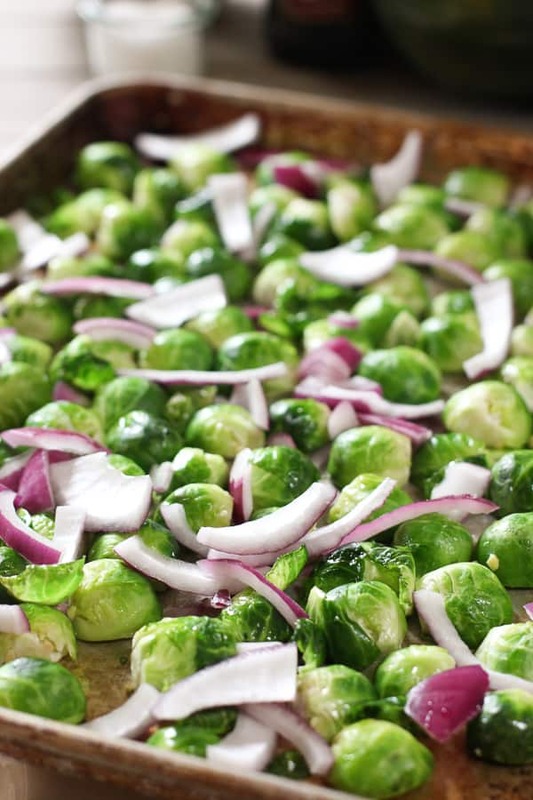 You either love brussels sprouts or you hate them…no middle ground. We kinda love them around here. I use them a lot in my sheet pan dinners because they roast up at the same rate as chicken and potatoes….my other two fave things to throw on a sheet pan! 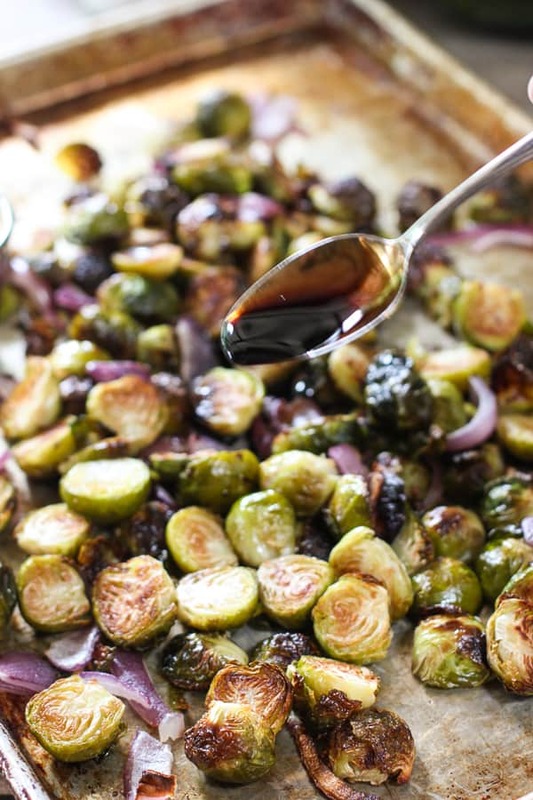 How to make Balsamic Roasted Brussels Sprouts! There isn’t too much to this recipe. 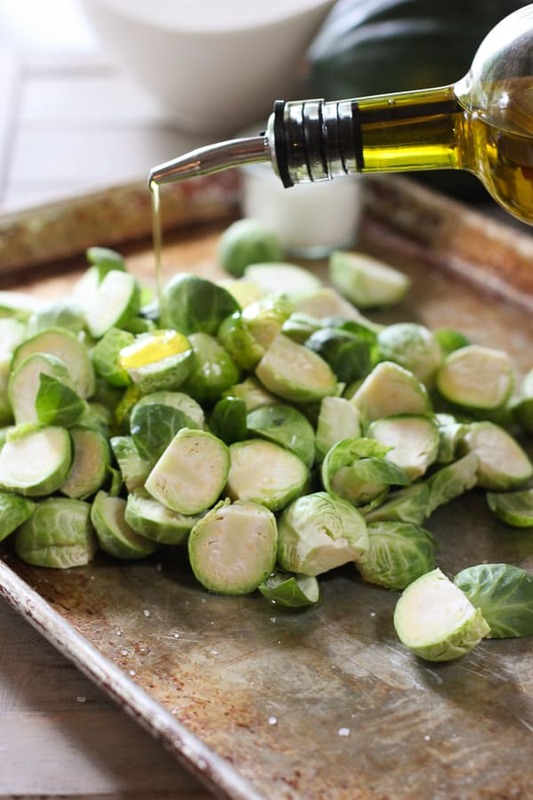 Simply trim the sprouts, toss in some olive oil, salt and pepper. Roast in the oven and then drizzle on the balsamic reduction. You can buy reduction most anywhere these days, but I just make my own. It’s a snap. Just pour balsamic vinegar in a saucepan, bring it to a simmer and let it reduce by half. Takes about 10 minutes. I usually make a double batch…it’s a great low cal sauce on chicken or pork. I tossed in some red onion but it isn’t necessary. I just kinda liked the extra flavor and color. Garlic would work well too. Buy or make your balsamic reduction. Trader Joes and Kroger both carry it. Easy directions to make are in the recipe card below. You can find all my healthy recipes here! To fresh veggies that taste to good to be fresh veggies! Check my favorite Easy Sheet Pan Dinners here! 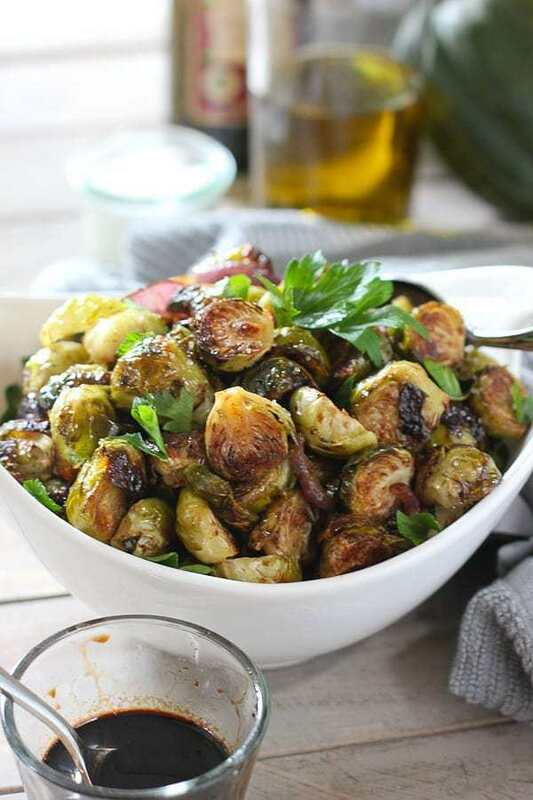 These easy to make Roasted Brussel Sprouts are a great way to get your veggies in! Simple roasted on a sheet pan and tossed in an easy balsamic reduction! Wash, trim and half brussels sprouts. Put them on a large sheet pan. Roast for 30-40 minutes, turning once, until browned evenly. While brussels are roasting, pour 1/2 cup vinegar into a medium saucepan. Simmer for about 10 minutes until reduced by half. Spoon warm balsamic reduction over brussels. These brussels sound so delicious! I’d love to try this recipe!